Are Laser Toys OK for Cats and Dogs? Hairballs: What Are They and Why Do Cats Get Them? Microchipping: What Is It and Why Should You Do It? What Is Feliway and How Does It Work? Why Does My Cat Rub His Face on Things? Don't Ignore These Signs of Illness in Your Kitten! How Can I Keep Soft Paws® on My Pet? Why Do Cats Pee on Their Human's Bed? Made in the USA. Accept No Imitations! Cats love curling up in small hidey-holes and taking a nap or watching the goings-on from their "hidden" spot. It probably makes them feel safe and helps them satisfy their hunter instincts of hiding and waiting for prey to show up. 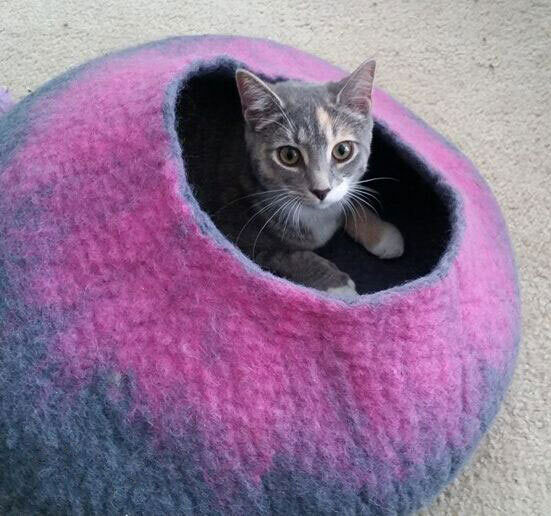 These Cat Caves are each handmade of all natural, 100% New Zealand wool. 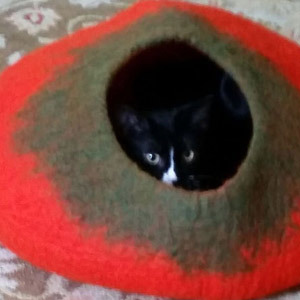 Cozy, and cats love the feel of the natural wool. Easy to clean: Vacuum, spot clean, or hand wash. Colored with vegetable dye that is safe for cats. Attractive to humans as well as cats; acts as an art piece in your home. Available in 19 beautiful colors. Measurements: 18" high, 10" wide, opening is 7". 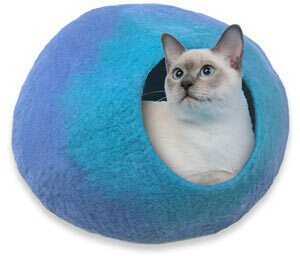 Slight variations may occur because each cat cave is individually hand-made. My humans have really done it this time! A Cat Cave arrived in the mail today. Can you believe it? I couldn't! This thing is so soft, smells great, and I could not resist climbing into it as soon as my humans opened it up for me. It is simply awesome. I curl up in there when I want to take a nap undisturbed, hide there when the dog is looking for me, and use it as a base of operations for my hunting expeditions. It's the perfect spot to sit and wait for a mouse or bird to go by, then leap out and pounce on the unsuspecting toy, er, prey. My humans really outdid themselves this time! I purchased one cat Cave and had to order another because this became the prime sleeping spot! Both cats were taking turns sleeping on the bed after squishing it flat. Now we have two of these and two happy cats. One is squished flat and one is a hide away cave! Great item! I have 3 cats and they all take turns in the one cat cave. I think they were all a little afraid of it at first but they like it now. It's thick material and good quality. I will buy another in the future. Disclaimer: This website is not intended to replace professional consultation, diagnosis, or treatment by a licensed veterinarian. If you require any veterinary related advice, contact your veterinarian promptly. Information at SoftPaws.com is exclusively of a general reference nature. Do not disregard veterinary advice or delay treatment as a result of accessing information at this site. *Soft Paws ® is a trademark for Soft paws nail caps for cats and dogs of Soft Paws Inc., Lafayette, LA. Patent No. 4,962,731. Made in USA.